Your social media account is the most public facing component of your brand. When managed properly, each social media platform can offer endless growth possibilities for your business. However, as anyone who has spent a great deal of time on social media knows, it’s not cute kittens and rainbows all the time. The challenge is, trying to figure out how to balance being the public face of your brand when handling those pesky negative comments. A single complaint on your social media account is like sparking a match. What you do next will determine if that spark will die out, or turn into a massive fire spiraling out of control. One of the most common tactics companies will take for responding to negative feedback is ignoring it. A T Kearney reveals that a whopping 70% of complaints on social media get ignored, while Forbes reported 50% of consumers gave brands only 1 week to respond to a question before they ended their business with them. Unfortunately ignoring complaints is usually done when a business has no idea what to do and hopes that it will eventually become out of sight and out of mind. While sometimes this may work, it’s definitely not best practice and can turn into a viral social media fire until a resolution has been made, like this case from Cracker Barrel. If these customers were to call to complain, you certainly wouldn’t hang up on them, so why would you ignore them on social media? This is single handedly the worst method you could have for handling social media complaints. Since you can’t delete comments from a Twitter post, the only effective way to remove them is to block the sender. When you block a person on Twitter, it blatantly notifies them as seen in the picture example. Facebook on the other hand will allow you to hide comments from a post, well.. sort of. When you hide a comment on a Facebook post, the comment will appear to be removed, however it can still be seen by the poster and anyone that they are connected to on Facebook. Regardless of what platform your negative comments are on, you never want to delete them. By participating in these censorship activities online, you are creating a major lack of trust for your brand and adding fuel to that sparked fire. These negative posters will find out, and they will fight back even harder by getting even more people involved in a negative complaint. Although there is the saying, all publicity is good publicity, the last thing you want to do is feed the internet trolls. 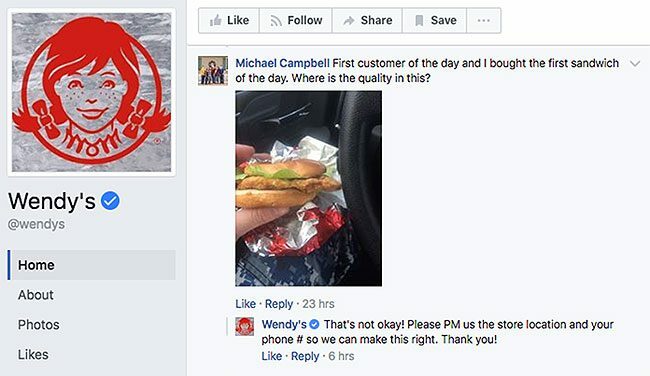 When people take the time to actually look up your social media handle in order to make a complaint, they don’t want just hear, “We’re sorry you had this experience.” Leaving them with these generic responses will often just make the disgruntled person even more upset due to the fact they know their complaints were heard, and the company didn’t care enough about them to do anything to resolve the issue. Now that you know what not to do, lets discuss how to turn these complaints into gold. We’re diving this into a 3 simple step process. You should always respond, no matter what the circumstance is. This allows other people to see that you genuinely care about your customers and builds trust in your brand. When dealing with Facebook, keep in mind, the more interactions you get on a post, the more it will be seen by your followers. By showing the public that you are a responsive brand, you are encouraging even more people to leave their comments since they know you are watching. 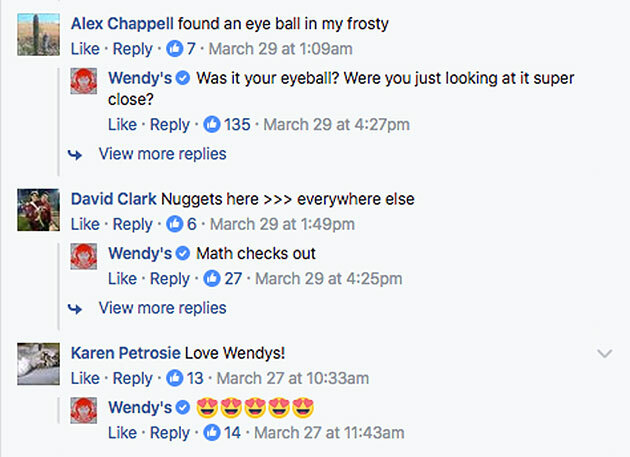 Wendy’s had recently been catching the public eye, by being great with their quick social media responses. They not only respond to complaints, but reward compliments too! Bonus points to you, if you can be clever and creative to your public responses while staying true to your brand. Depending on the severity of the complaint, you may need to move the conversation out of the public view. Use your best judgement to determine if the person leaving the negative comments is a legitimate person who is disappointed, or just an internet troll trying to spark a fire. For example, if someone has attached a picture of a defective product, you will want to move this conversation to a private message. Always respond to the original comment publicly, and inform the person that either to reach out to you in a private message or take initiative to send them a private message(PM) immediately after. Pro tip: When dealing with Twitter, you can’t send direct messages to people who are not already following you. Therefore, you may need to advise them to follow you first so that you can send them a private message regarding their experience. It goes without saying that once you have moved a conversation out of the public eye, that you should have some type of resolution ready in your back pocket. Effective solutions can be anything from a discount, credit, free product or repair. Turning a negative customer into a happy one can be more effective than a single happy customer. Oftentimes, these customers will remove their negative comments and replace them with positive ones in addition to becoming a brand advocate. Creating brand loyalty should be a top priority for every growing company, because the benefits will far outweigh the minor cost over time. Social media offers a great way to personify your brand. By now, you’ve probably heard the saying “nobody is perfect” a million times. Just like no single person is perfect, no matter how great your brand is, no single brand is perfect either. What’s important is that you take the opportunity to learn how to embrace the feedback you receive to build a stronger foundation for your overall brand. That person leaving you negative feedback online is giving you the opportunity to rectify their experience, while there may be dozens of silent unhappy customers who won’t. 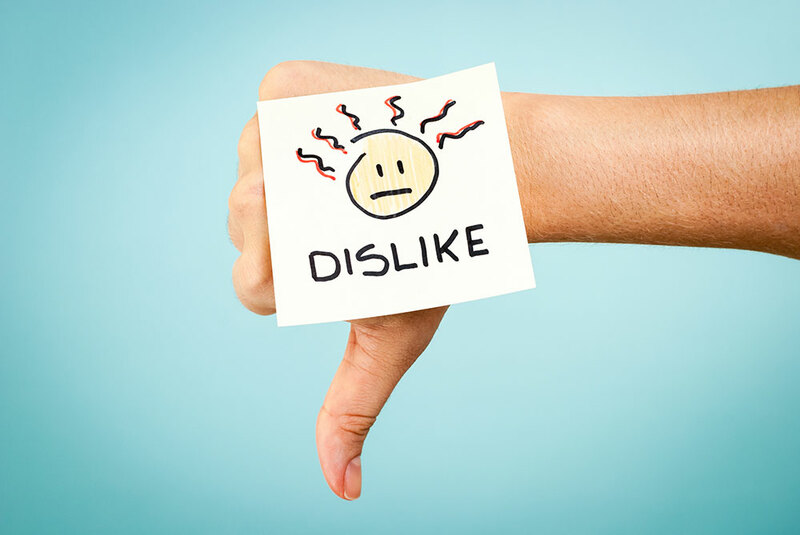 With these three steps to handling negative feedback on social media, you now have the secret sauce to turning these social media complaints right back into your bottom line.